Location: To reach Dragon Lake, travel about 4.2 km (2.6 miles) south of the city of Quesnel. Turn east off Highway 97. Travel on a paved road for 3.2 km (2 mi) to a boat launching site on the lake. 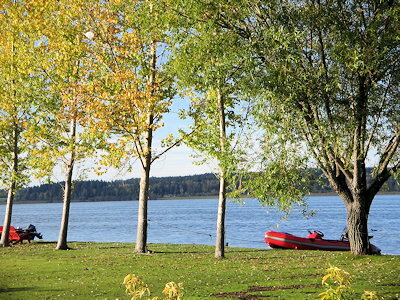 Resorts & Campsites: Dragon Lake has one resort with campsites and boat launching. Many public docks with boat launching. All facilities and services, including a great fly & tackle shop, can be found minutes away in the nearby city of Quesnel. 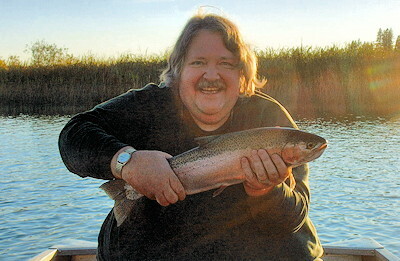 Fishing Report: One of the jewels of the Cariboo, Dragon Lake is the home of trophy size rainbows. Twelve pounders are caught on a regular basis and because of such great fishing, this lake is often featured on TV fishing programs. All methods of fishing work well, however, Dragon Lake is considered a fly fisher's dream. If you are visiting the Quesnel/Barkerville area, fishing this lake for that trophy rainbow should be high on your list of priorities. Viewscape: Dragon Lake is situated among moderately hilly terrain which is 80% forested in apen, birch and Douglas fir. The remaining 20% consists of farm and pasture land. Many residences are found on the west and north side of the lake. Shoreline: Sandy gravelly soil and black loamy soil surround the lake. Cattail and soft-stem bullrushes are found around most of the shoreline. see Milburn Lake and Bouchie Lake, just west of the city of Quesnel.